Chris Ault, the innovator behind the pistol offense and long, long-time head coach of Nevada Wolf Pack football, is officially stepping down after 28 (non-consecutive) years. In that time, Ault recorded some impressive statistics, including only two losing seasons in his tenure, and 27 seasons of outscoring opponents. 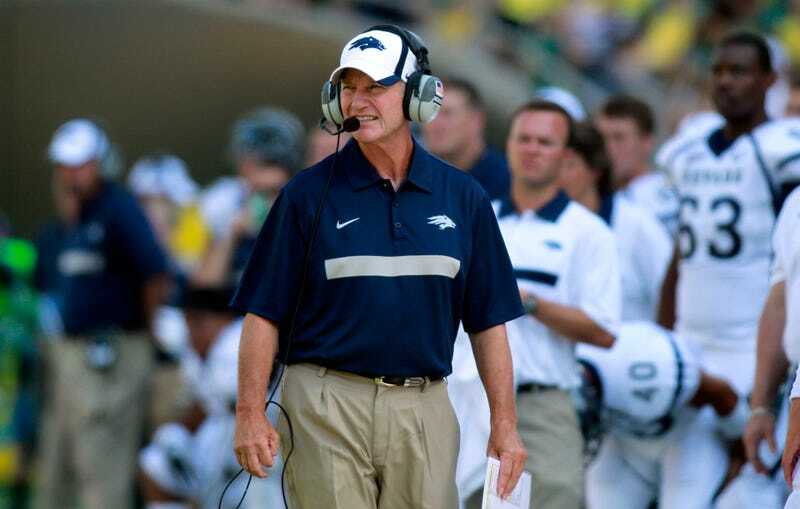 Ault arrived in Nevada in 1965, as its quarterback, and started as head coach in 1976; between then and his first retirement in 1995, he led the Wolf Pack out of Division II and to multiple bowl wins. Ault also started as athletic director in 1984, serving until 2004, whereupon he fired Chris Tormey after four disastrous seasons and began overhauling the football team anew from the sidelines. "They thought I'd lost my marbles," Ault recently recalled. But with the "Pistol" Nevada went from near the bottom to the top of its conference in offensive production and over the next few years slowly added additional components to the attack to make it even more effective. The potency of Ault's offense peaked during the 2009 season when they finished the season with three 1,000-yard rushers – two running backs as well as lanky junior quarterback, a Colin Kaepernick, who added another 2,000 passing yards and 20 touchdowns. The following offseason [then Stanford offensive coordinator Greg] Roman – along with many other coaches from across the country – visited Ault. He wanted to learn how to add some Pistol looks to the pro-style offense he ran at Stanford under head coach Jim Harbaugh. During their visit, Ault was, according to Roman, "very accommodating and it was very interesting as a coach to go really learn something totally new," he said, adding, "That was very valuable time spent." Since then, other teams with mobile quarterbacks in both NFL and NCAA football, including the the Panthers and the Tebow-led Broncos, have dabbled in pistol sets. Robert Griffin III's Redskins and Colin Kaepernick's 49ers have incorporated Ault's offense more extensively. Ault said he felt he'd hit a ceiling with Nevada, both in terms of his ability to coach the team to progressively better results, and in that Nevada has a tiny football budget of $5 million. (Alabama's, for comparison's sake, was last reported at $31.6 million.) Ault did not say he would retire, only that he was leaving Nevada. Ault ends his time in Reno with a 233-209-1 record; he has already been a member of the College Football Hall of Fame for ten years. Nevada will now have a place on college's football's endless coaching carousel for the first time in nearly a decade, and for the first time in nearly three, Ault won't be a candidate for take the job.